Montreal, Quebec, Canada, March 27th , 2017 – MONARQUES GOLD CORPORATION (“Monarques” or the “Corporation”) (TSX-V: MQR) (FRANKFURT: MR7) is pleased to announce the initial results from the 2017 drilling program on its Croinor Gold property, 70 km east of Val-d’Or, Quebec. 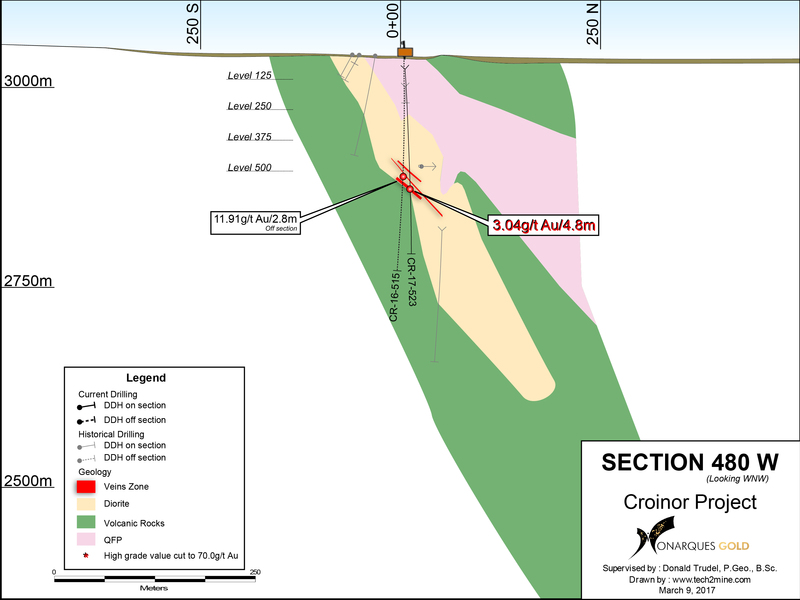 The 10,000-metre drilling program is designed to further investigate the most favourable areas tested on Croinor Gold in 2016, pursue exploration in the Gold Bug area and drill the Croinor Gold deposit at depth. 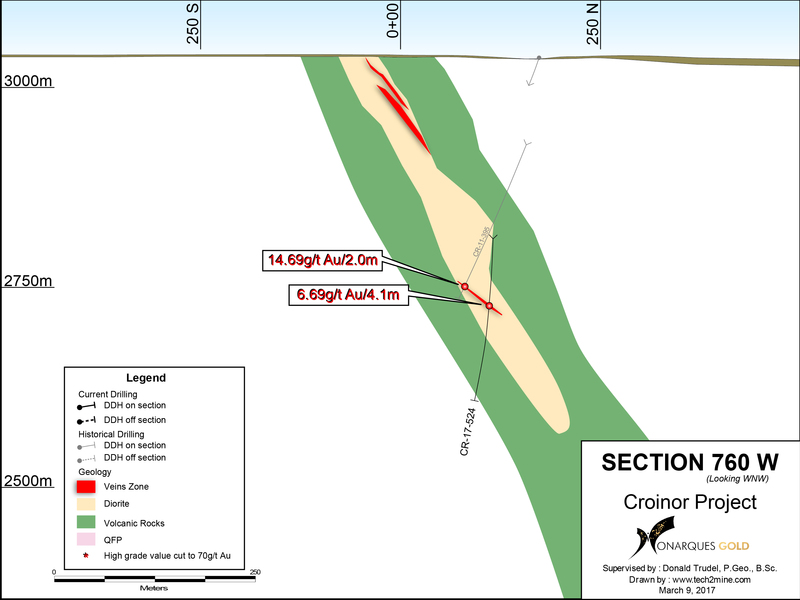 Holes CR-17-522 to CR-17-524 have returned high-grade intersections from Sections 760W and 480W in the west part of the Croinor Gold deposit, one of the areas tested in 2016. Hole CR-17-524 intersected a quartz-tourmaline zone on Section 760W in a 4.1-metre long sericitic envelope (3.2 metres true width) grading 6.69 g/t Au, including two high-grade intersections of 37.0 g/t Au over 0.5 metres and 10.3 g/t Au over 0.7 metres. This zone, intersected at a vertical depth of 310 metres, confirms the continuity of the zone intersected by historical hole CR-11-395 (14.69 g/t Au over 2 metres), located 38 metres away down dip. Hole CR-17-523 confirmed the lateral continuity and dip of the mineralized structure intersected in Hole CR-16-515 (see press release dated February 2, 2017), which returned 11.91 g/t Au over 2.8 metres, including 46.6 g/t Au over 0.6 metres, on Section 490W. Hole CR-17-523 was drilled on Section 480W, 10 metres to the east, and intersected 3.04 g/t Au over 4.8 metres (3.4 metres true width). The structures remain open at depth in both cases. The table below shows the results obtained to date, with true widths indicated were allowed by the quantity of information (see longitudinal). Sampling normally consisted of sawing the core into two equal halves along its main axis and shipping one of the halves to the ALS Minerals laboratory in Val-d'Or for assaying. The samples are crushed, pulverized and assayed by fire assay with atomic absorption finish. Results exceeding 3.0 g/t are re-assayed using the gravity method. Samples containing gold grains are assayed using the metallic sieve method at the ALS Minerals laboratory in Val-d'Or. Monarques has established a full QA/QC protocol, including the insertion of standards, blanks and duplicates.